This Coconut Flour Pie Crust makes it possible to enjoy gluten free pie that also is low carb. There is even a paleo and vegan option. Add your favorite fillings to this delicious flaky crust. Add all ingredients to the bowl of a food processor. Close the lid and pulse until the ingredients combine to form a ball. Pad the dough ball into a flat disk and chill in the fridge for about 20 minutes or in the freezer for 5 minutes. Place the chilled disc between 2 sheets of parchment paper and roll out evenly to about 11 inches in diameter. Place the rolled out dough in the fridge one more time for about 5 minutes, then remove one layer of parchment and flip the rolled out crust over into a 9-inch pie pan. Remove the other layer of parchment and gently push the crust into shape in the pie pan. Using a small paring knife cut off any overhang and smooth out the cut edge with the warmth of your fingers. Poke the crust with a fork all over the bottom and the sides. Then pre-bake the crust for 15 minutes in the oven. Pull out and fill with your favourite filling, then bake again if required. 1. Sweetener - I don't add any sweetener to my pie crust even if I use it for a sweet pie. But if you prefer you can add 1-2 tablespoons of granulated sweetener to the other ingredients when making the dough. 2. 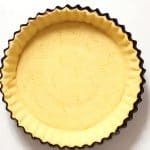 Coconut Oil - When substituting coconut oil for butter in this healthy pie crust recipe, I like it to be solid just like butter from the fridge would be. 3. Pastry Cutter - A pastry cutter can also be used to combine the ingredients into a dough. Work them until the crumbles look like wet sand, then use your hands to push them together into a disc shape. 5. Rolling Pin - If you don't have a rolling pin, an empty (wine) bottle with flat sides will do the trick. 6. Chilling Twice - Chilling the pie dough one more time after rolling is important. Otherwise it rips much too easy when trying to transfer it to the pie pan. 7. Pie Pan - I like using a pie pan with fluted edges because it looks super fancy and eliminates any need for creating crimped edges.